Translation of a piece by pre-eminent communications theorist Manuel Castells, originally published in La Vanguardia. I haven’t bothered to translate acampada because I think that it is likely to be one of those words that, in years to come, will get imported into English untranslated, like soviet. It is a useful corrective to certain cloth-eared assessments of the protests in Spain that would characterise them as some sort of impotent half-cry half-grunt toward heaven from the swinish multitude who just won’t accept the panglossian prescriptions of sighing neo-lib reality dwellers. And all of a sudden the hollow singsong of the electioneering speech became unbearable. In the midst of an unceasing crisis, with 21% unemployment, 45% youth unemployment, cuts in living standards for many and fat profits for a few, impunity for the corrupt and privileges for a caste of untouchable politicians, the disgust became a network. A little before the municipal elections on the 22nd of May, nolesvotes.org [literally, don’tvoteforthem.org] had 700,000 unique users, 154 blogs and 641,000 results in Google. In that atmosphere of outrage were germinated the ideas for the manifesto of Democracia Real Ya, a collective created in Madrid, which ended by saying “An Ethical Revolution is necessary. We have put money above human beings and we must put it at our service. We are people, not products of the market. For all of the above, I am outraged. I believe I can change it. I believe I can help. I know that united we can do it. Come out with us. It’s your right”. And on the 15-M they came out, tens of thousands of them, in Madrid, Barcelona and many other cities. At the end, in Madrid a few spent the night in the Puerta del Sol, and the following day some more in Barcelona on the Plaza Catalunya. They talked, they dreamed and they tweeted their networks of friends. The next day they were hundreds. Then, thousands. When they were evicted from the Puerta del Sol, many thousands more came. So many, that when the Electoral and the Constitutional Boards declared it illegal to “call for a responsible vote” during the day of of reflection, the police could not impose it. The size of the acampada made it unviable. The acampadas proliferated in Spain and they extended through the world. On the 25th, after the elections received with total indifference in this emerging society, despite the fact that it signaled the total collapse of really inexisting socialism, there were 706 acampadas registered on the map of the globe. (www. thetechnoant. info/ campmap/). They keep appearing as each locality adds its peaceful, festive and protesting demonstration to the networks weaved between cyberspace and urban space. Media attention helped to broadcast a phenomenon that everyone was in a rush to label, but that few politicians dared to condemn for the moment. It was not a case of the usual suspects. They come from all corners, conditions, ages and social groups. Look at the photos on Flickr (acampadabcn.org) to perceive the diversity. It soon became clear that there were no leaders. If anyone tried to be one, the acampada deauthorized it. Whilst they were grateful for the services done by Democracia Real Ya, the campers did not accept any logos. In Acampadabcn it was decided that each person represented herself. Everything is worked out through functional, theme-based, autonomous multiple commissions, co-ordinated by an intercommission whose members rotate. The decisions that affect everyone go through the assembly at the end of the day. Motions, organization and tactics are debated. They are intense debates, carried out with respect, creating a new dynamic of gestures to avoid noisy expressions (in the spring air fluttered the hands that wave yes or the sullenly crossed arms of the noes). Swearing was forbidden. Drinking was counselled against, drugs rejected, though the matter is under debate. Any hint of violence is controlled: in the first ten days there was only one incident. Non-violence is a basic principle assumed by all, tested when the authorities have grown tired of being overridden and have taken to dishing out beatings. Once the elections had passed, the movement extended, concretized, and deepened. It extended through other cities and decentralized itself into neighbourhoods, sketching out mini-acampadas that could even reach as far as places of work. It concretized with each acampada deciding its own objectives, and its organisation and demands were decided. And it deepened through a growing concentration on the programmatic elaboration of objectives. On the 25th AcampadaSol released a document synthesising the motions approved by the assemblies since the 16th: elminiate the privileges of the political class; measures to tackle unemployment, including job sharing and the rejection of the rise in the retirement age as long as there is youth unemployment; right to housing, including the expropriation of unsold housing stock in order to place it on the market under a programme of protected rents; quality public services, including the elimination of wasteful administrative spending, the hire of health and education workers, cheap and eco-friendly public transport, control over banks, constituting a public banking system under the control of society, with those entities that go bankrupt returning to public funds the capital they have received; fiscal reform, raising taxes on the very wealthy and on banks, and controlling fiscal fraud and capital movements; civil liberties and participative democracy, starting with the abolition of the Ley Sinde, which restricts internet freedom; protect freedom of information and investigative journalism; modifying the electoral law to put an end to political discrimination, including the representation of the null and blank votes; judicial independence, internal democracy in the political parties; reduction in military spending. I cite these objectives to emphasise how concrete and reasonable they are, even though the immediate utopia of a different life is also present in many minds. But what is transformative is the process more than the product. It is the elaboration in open commissions and the decision taken in assembly. It is a new politics for exiting the crisis towards a new way of life built collectively. A slow process because, as a poster reads in Barcelona, “we’re going slowly because we’re going far”. So those who minimize the wikiacampadas still do not understand how profound they are. They may leave the squares, to return to them periodically, but they will not leave the social networks and the minds of those who participate. They are no longer alone and they have lost their fear. Because they discovered new forms of organization, participation and mobilization that burst the traditional channels belonging to those whom a large section of society, and the majority of young people, distrust. 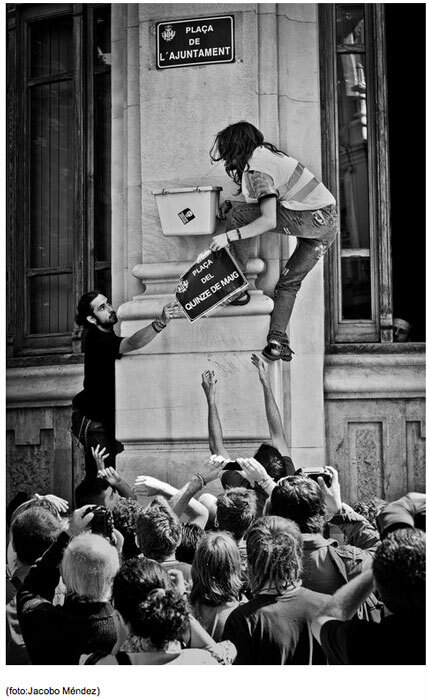 Parties and institutions will have to learn to live with this emerging civil society. If not, they will hollow out from the inside while citizens move from wikiacampadas to that networked democracy yet to be discovered in a collective practice that finds its root in every person. As you obviously know the term ‘acampada’ means ‘camp’ so I am puzzled by your statement about it. Acampada is not a necessarily political or governmental designation as ‘soviet’ is. It’s also been used in rural social movements in Latin America long before the Plaça del Sol; and has an untranslatability (or a specifically political manifestation that can’t be communicated by a term that can also be general) in that sense, too…. Well, yes, the two words are not entirely comparable in meaning for the reasons you cite. I wasn’t suggesting that there was some sort of parallel between soviets and acampadas, simply commenting that the specificity of the word given the particular socio-historical context meant it may end up becoming an imported word. There are other more mundane examples of this, I guess. That’s a very valid point you make, and I appreciate very much that you have made it here. To be honest I had not given any thought to the ‘other contexts’ when doing the translation, not least because I’m largely ignorant of them, and moreover the scholarly content in English, but you are entirely right in what you are saying. Thank you for this, to which I was directed by Micah White of Adbusters. An American, unemployed, 58, with high medical bills – I too am sick of money first, people last! I loved Barcelona when my doctor (also like me no money, treated PEOPLE first) husband and I visited 9 years ago – Spain has a wonderful history, as Mexican author Paco I Taibo can testify. how exciting! Thanks for the comment. I haven’t read any of PIT’s books, so thanks for the recommendation too.